All fruits and veggies are very healthy additions to any diet, but there are some members of the produce category are simply hard to categorize. We also share advice to help you quickly categorize any item of produce you encounter. Read on to learn more. #1 – Why Is The Vegetable Category Such A Quandary? Why is it that some fruits and veggies, such as potatoes and apples are so easy to categorize while others perplex us? The reasons range from culture to vocabulary usage to botanical identity to culinary custom. In botany, the term “vegetable” typically refers to the edible parts of a plant not involved in plant reproduction. The part of the plant resulting in flowering and pollination is typically thought of as a “fruit”. Culinary custom adds another layer of consideration. In western culture, cucumbers are treated as vegetables in the kitchen and at the dinner table. They are sold as veggies in the market. From a cultural and culinary perspective, cucumbers are a vegetable (produce). #2 – Horticulturally, Is Cucumber A Fruit Or Vegetable? In the horticultural industry, the products of a herbaceous, annual plant are vegetables. The products of a woody, perennial plant are fruits. Herbaceous plants are tender-stemmed plants that die back annually. Woody plants are perennials with stiff, durable stems that return year-after-year (i.e. trees). For this reason, horticulturally speaking, cucumbers are vegetables. Apples are fruit. #3 – Botanically Speaking, Are Cucumbers Fruits Or Vegetables? If you can eat it, and it doesn’t contain seeds, it’s a vegetable. If it develops from the flower and contains seeds, it’s fruit. For this reason, botanically speaking, cucumbers are fruit. Potatoes are vegetables, as is celery. #4 – In Culinary Terms Is A Cucumber A Vegetable Or A Fruit? In cooking, fruits are usually considered sweet, and vegetables are generally considered savory. Furthermore, when an item of produce is served helps determine whether it is considered fruit or vegetable. Produce eaten as or with the main course of a meal is generally considered a veggie. Produce eaten after the meal, as dessert, is generally considered fruit. Cucumbers are usually eaten before the meal in salads or during the meal as a side dish; therefore, culinarily speaking, cucumbers are a vegetable. Because cucumbers have such a pleasing taste and texture, it makes a great snack or addition to a wide variety of fresh veggie dishes. Crisp, garden-fresh cucumbers are delicious in salads, sandwiches or eaten out-of-hand. It’s easy to see why these tasty, watermelon-like culinary veggies are also thought of as fruit. #5 – Can You Use Cucumber As A Fruit? Yes, with its mild flavor it can be used as you would watermelon and other light, watery fruits. Here’s a cucumber ice cream recipe that is so simple a pair of very clever kids can do it! #6 – What Kinds Of Cucumbers Are There? When you visit your local supermarket you may find English or European cucumbers. These are hothouse grown and are ideal for slicing. Various slicing varieties are excellent for eating fresh. This type of cucumber is typically longer, smoother and darker green than the types used for pickling. Pickling cukes are short and squat and a bit bumpy. They are typically a paler green than the varieties meant to be served raw at the table. Even so, pickling cucumbers are perfectly tasty eaten fresh in the summertime. They are also ideal for pickling to enjoy year-round. If you don’t want to (or know how to) make traditional pickles, try making refrigerator pickles! #7 – How Good For You Are Cucumbers? 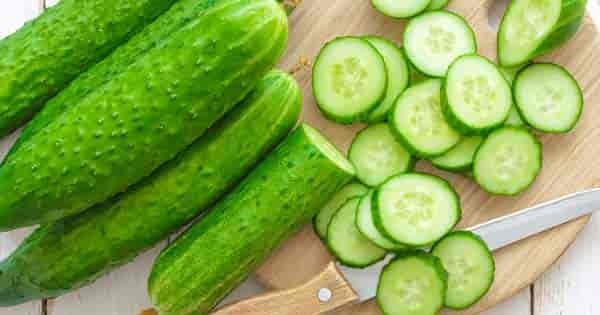 Cucumbers are very low in calories and very high in water content. This makes them a great, hydrating addition to dieter’s menus. A full cup of sliced cucumber only has about thirteen calories and contains almost a full cup of water! #8 – How Do You Choose Good Cucumbers? “Cool” and “cucumber” go together. At your local supermarket, cucumbers should be kept chilled. When shopping at an outdoor market, only buy cucumbers displayed in the shade. Choose smooth, plump and symmetrical cucumbers. The dark green, slender and firm cucumbers have the best taste. Don’t purchase any that look withered, shriveled, bruised or bloated in the middle. Avoid overripe cucumbers as they have watery flesh, large seeds, and poor taste. #9 – How Do You Keep Cucumbers Fresh? When you arrive home from the market, get your cucumbers into the veggie drawer of your fridge right away. Don’t peel them or wash them (unless they have a lot of garden dirt on the skin). If you do have to wash them, wipe them dry before storing. If you have a lot of cukes and they would be crowded, wrap each one individually in paper toweling or a tea towel before placing them in the drawer. This helps prevent bruising and decay. #10 – How Long Will Cukes Last In The Fridge? Cucumbers bought from the supermarket usually have a wax coating and can last a week in the fridge. Fresh produce straight from the garden does not have this coating and will not last as long. Use them within two or three days of picking. If you have leftover peeled cucumbers, cover or wrap them tightly with plastic wrap and store them on the top shelf of your fridge (where it’s cooler). #11 – How Do You Prepare Cucumbers For Eating? Wash cucumbers thoroughly before using them. Supermarket cucumbers with a wax coating should be peeled. Garden fresh cucumbers can be eaten, peels and all. English cucumbers have softer peels. Toss a couple of cups of thin-sliced cucumbers with a cup of thin-sliced red onion. Prepare a dressing of 50/50 white vinegar and water. 1/3 of a Teaspoon each of dill weed and coarsely ground black pepper. Toss and refrigerate for at least an hour. Other herbs and flavorings that go well with cold cucumber include mint, tarragon, red pepper, and lemon. There are some places where cucumbers are served cooked. Their light flavor complements heavier meat dishes well. It is especially nice with fresh game, such as venison. To make a simple cooked cucumber dish, peel, and roughly dice cucumbers. Season with parsley or dill and salt to taste. #12 – Do Cats Care If Cucumbers Are Fruits Or Vegetables? As far as cats are concerned, whether a cucumber is a fruit or a vegetable is entirely irrelevant. Cats are alarmed by any fruits, vegetables or other strange objects that sneak up behind them while they are eating (but mostly cucumbers and sometimes bananas).